The holiday season is a fun and special time to visit Disney World. 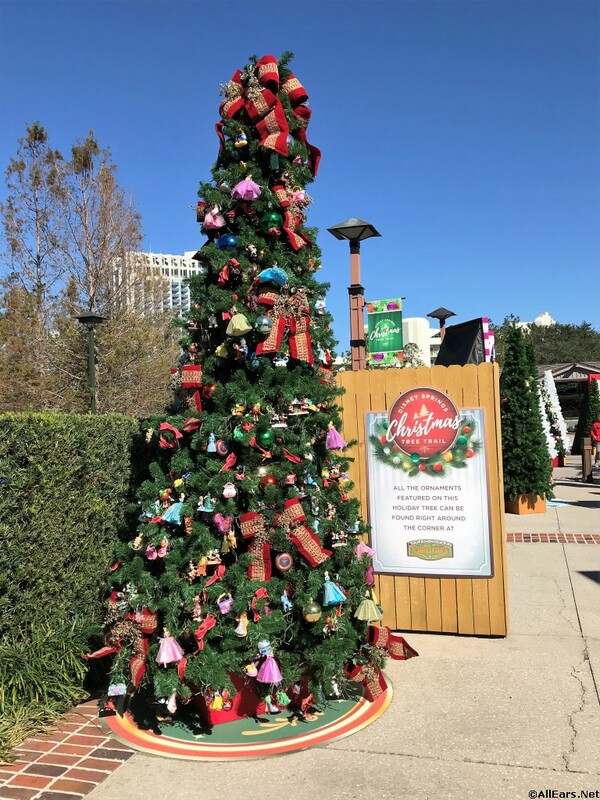 The parks are beautifully decorated as the Magic Kingdom hosts Mickey’s Very Merry Christmas Party, Epcot is home to the International Festival of the Holidays, and Hollywood Studios presents the Sunset Seasons Greetings and Jingle Bell, Jingle BAM! shows. But, what if you don’t want to go in the parks? 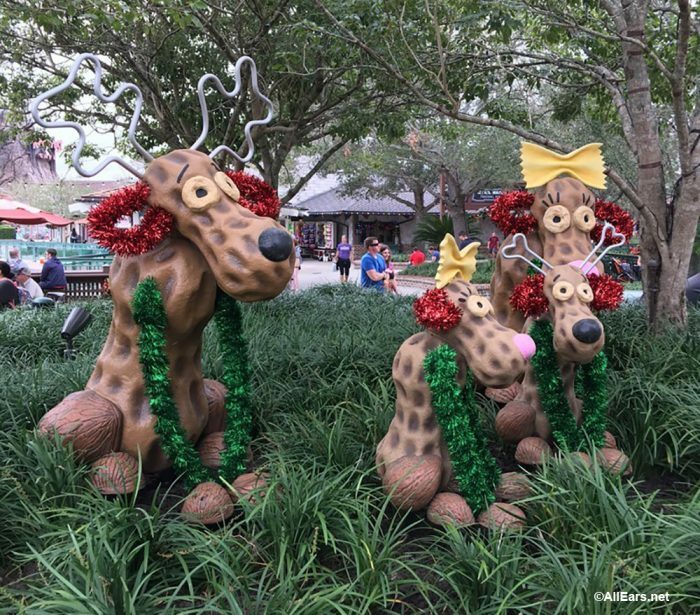 There’s plenty of free or relatively low-cost holiday things to see and do outside of the parks during the holidays if you don’t want to buy a park ticket. Disney Springs is Disney’s shopping, dining and entertainment complex. Parking here has always been free, and now it’s plentiful thanks to two new parking garages (and one more is in progress). 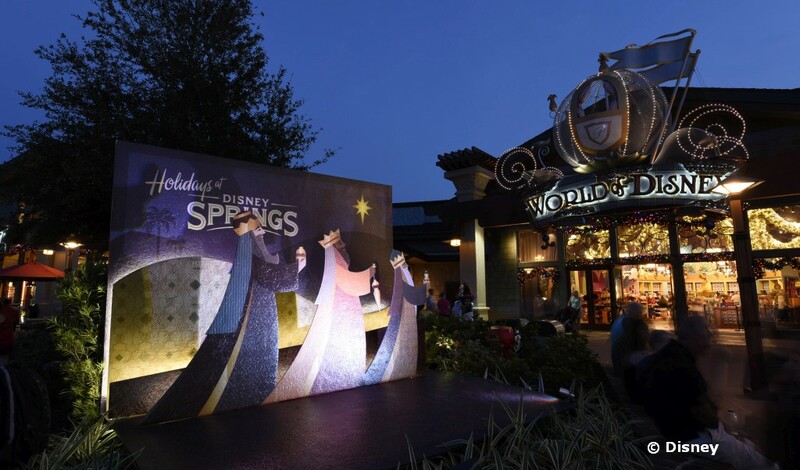 Disney Springs is decked out for the holidays with 2,000 pieces of holiday décor! You’ll find topiaries dressed up, floral arrangements, reindeer, and so much more all over this area. 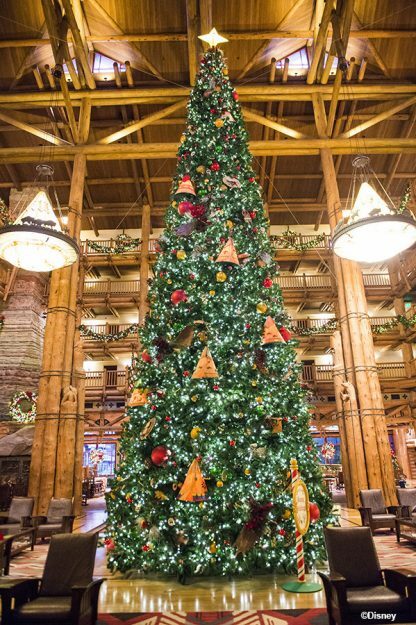 One of the pieces of décor is an impressive Christmas tree that stands 45 feet tall! 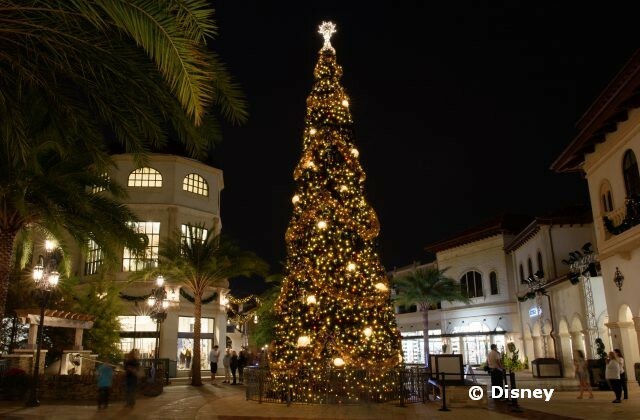 In addition to that huge tree, Disney Springs is home to 27 “regular” sized Christmas trees on their Tree Trail. But, these aren’t just any old Christmas trees. 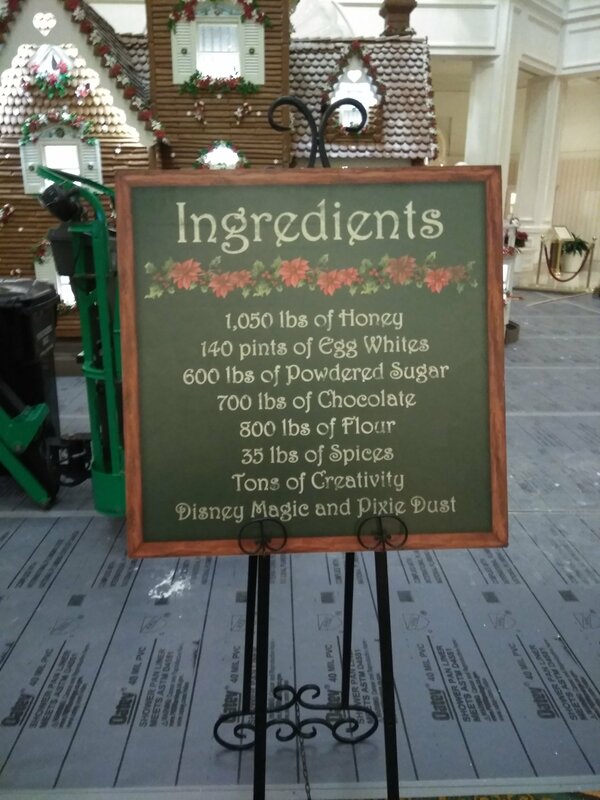 Each one is themed to a movie or attraction and elaborately decorated to match that theme. 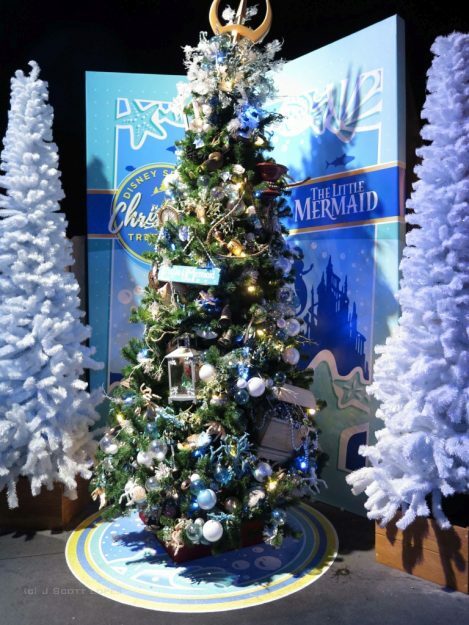 On The Little Mermaid tree you may find starfish and seashells, while on the Haunted Mansion tree you’ll find Madame Leota’s gravestone and other items reminiscent of the attraction. Each tree is picture perfect! At the end of the Tree Trail you’ll find Santa in his Chalet waiting to hear what you or your kids have their Christmas wish list. After December 24, Santa Goofy takes over for Santa in the chalet since we think Santa will be sitting on a warm beach somewhere taking some deserved time off after Christmas! Also, be sure to take the time to read the signs on the fence around the Tree Trail! You might get a laugh or two! 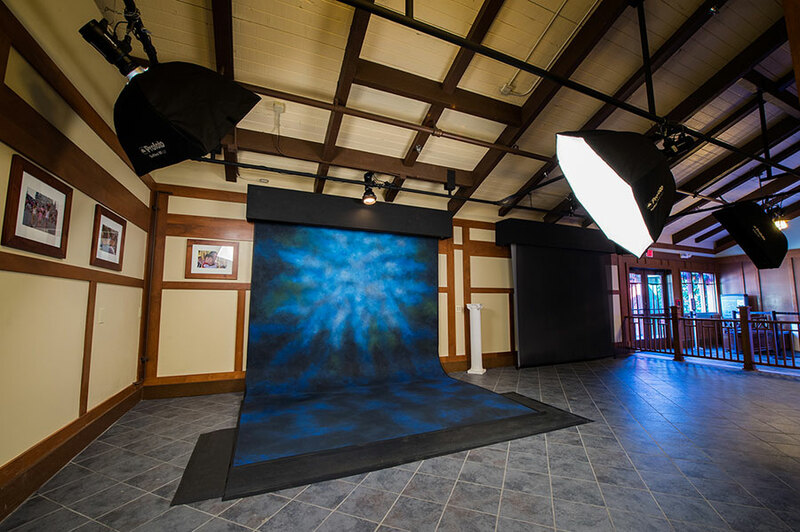 Did you know there is a PhotoPass studio in Disney Springs? 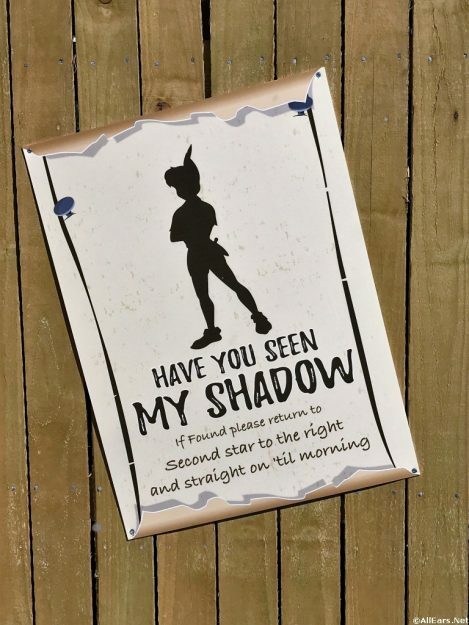 Stop by and have you and your family’s photos taken with Disney backgrounds. Photos are available for purchase or download, just as PhotoPass photos are around the parks. 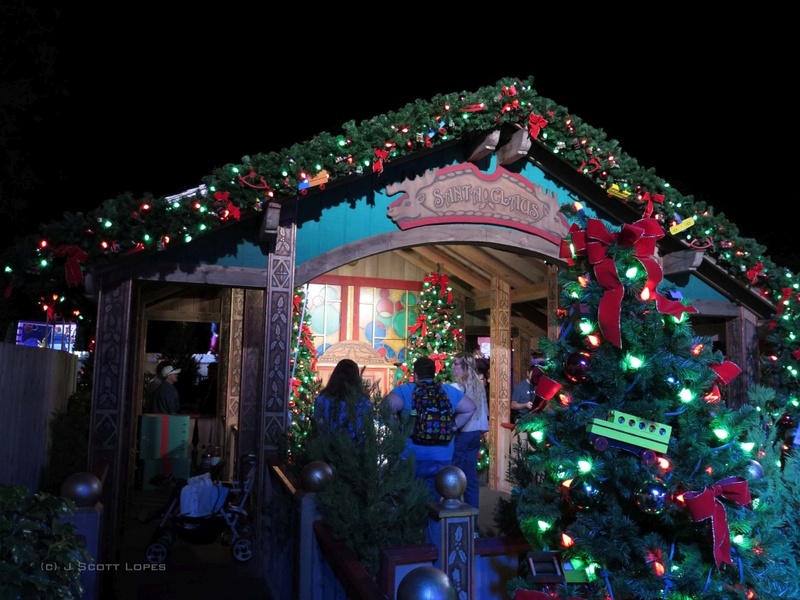 You might also see a PhotoPass photographer or two along the Tree Trail and at other locations around Disney Springs (including at Santa’s Chalet). You’ll find the studio between Marketplace Co-op and the Arribas Brothers Crystal Arts Stores. 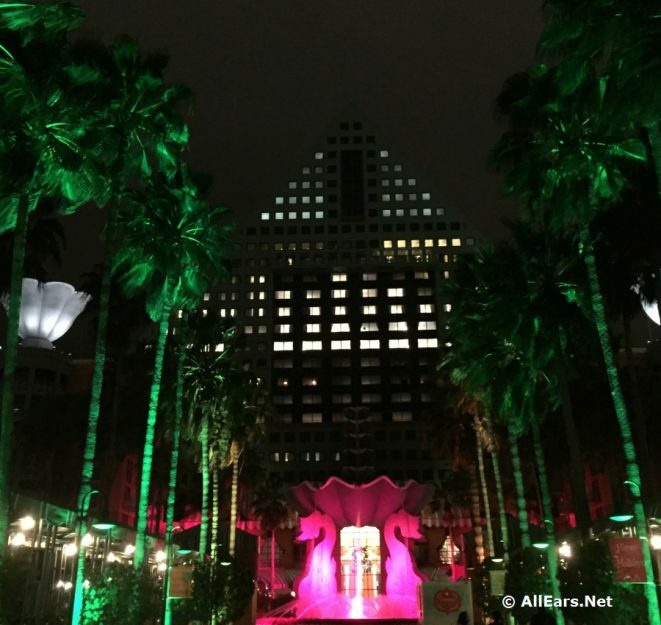 Even if you are not a guest at a Disney resort you can still visit a Disney resort. Christmas is a great time to do this because all the resorts don their holiday finest, plus there’s great dining at Disney resorts. In fact, in our opinion, some of Disney’s best restaurants are at Disney resorts. Park your car in the Magic Kingdom parking lot and board the resort monorail to visit the Grand Floridian and Contemporary resorts for their extra-sweet Christmas decorations. The Contemporary Resort holds the honor of being home to Disney’s tallest Christmas tree – it stands 70 feet tall, has 16,000 lights on it along with 200 custom-made ornaments! This is a wonder anytime, but especially at night when it is lit. 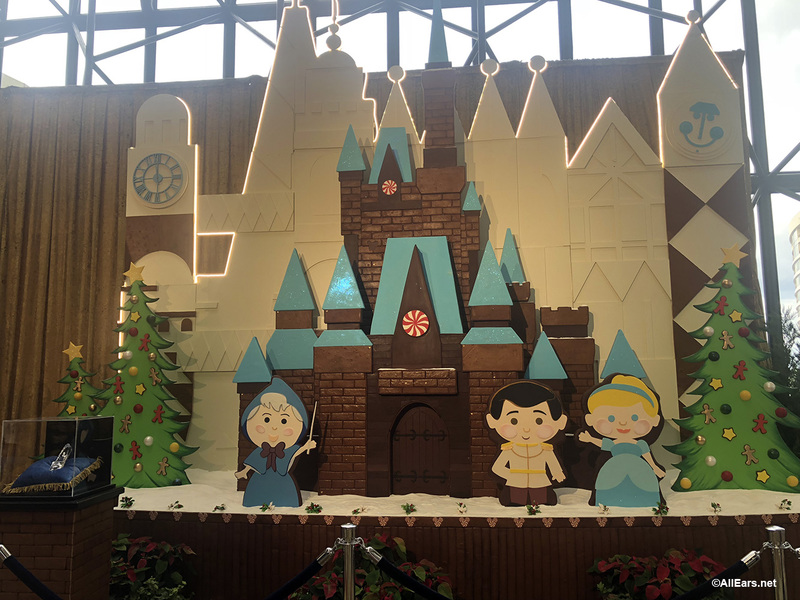 Inside the Contemporary travel to the fourth floor to see a gingerbread version of Cinderella Castle, complete with cookie-fied Cinderella, Prince Charming and the Fairy Godmother. Fans of “it’s a small world” will appreciate the backdrop, which is a salute to the attraction and artist Mary Blair. You can also buy sweet treats here, including gingerbread, chocolate, peppermint indulgences and a beautiful white chocolate Cinderella figure trimmed with gold. The Contemporary is also home to the Contempo Café, which is known for creating delicious and themed baked goods. We are always anxious to see what they come up each holiday season. 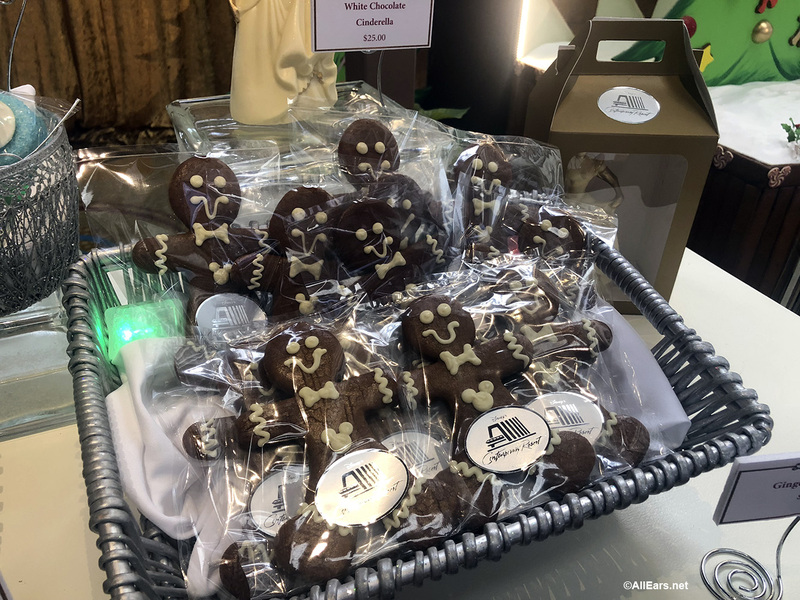 You’re likely to find some themed cupcakes, and maybe even a cookie or two! When you’re at the Contemporary you can grab a (free) boat ride over to the Wilderness Lodge. This resort is another that is massive in size, and has quite a lobby area (it even has a creek running through it!). Stop here to see the tree that stands in this lobby as well as other décor around the resort. The Lodge is home to Roaring Fork, which like the Contempo Café, may also have some holiday-themed sweet treats. 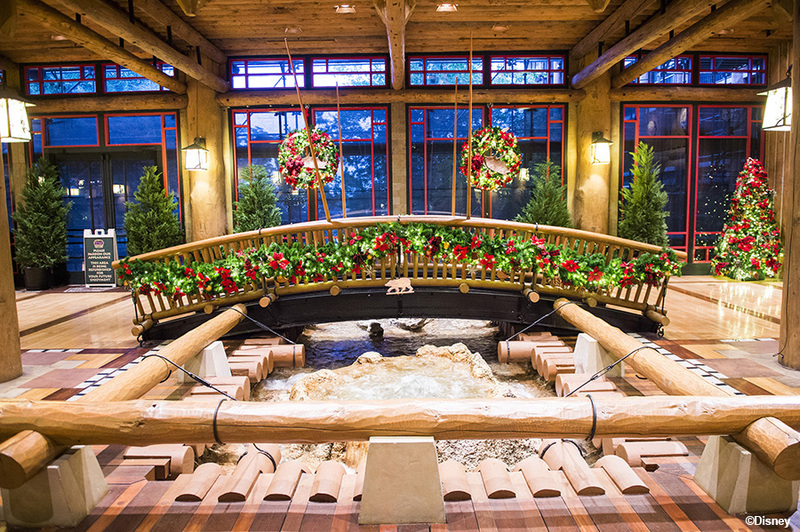 Wilderness Lodge Creek Bridge — in the Lobby! 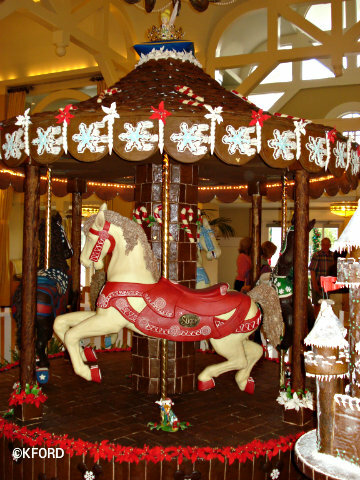 Each year, the Beach Club resort’s chefs build a 100-percent-working, three-horse carousel out of gingerbread and set it up in the lobby. 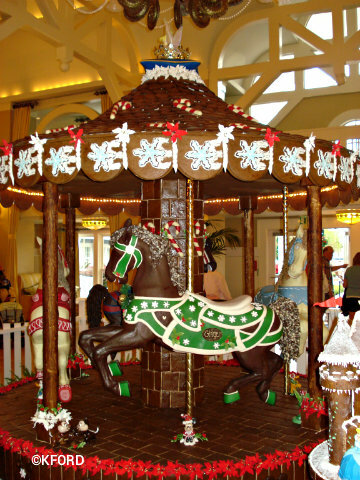 The theme of the carousel changes every year, and so do the details and decorations on each of the horses. You’ll also find fun Christmas decorations around the resort with a beachy theme! 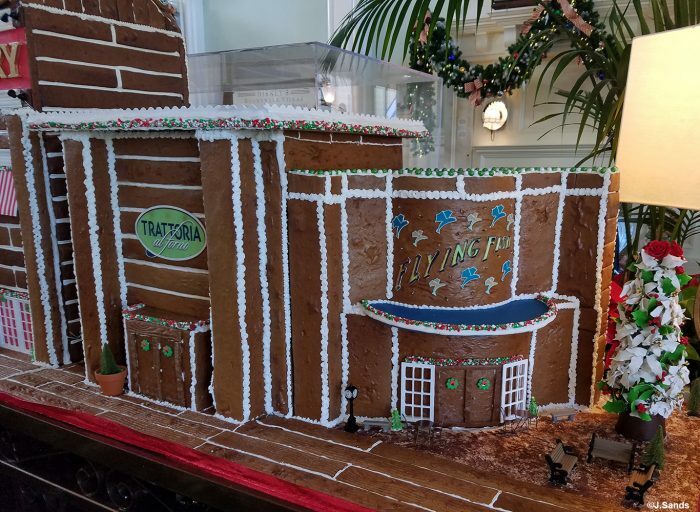 Plus here, and at other gingerbread-adorned resorts, the tantalizing aroma of gingerbread surrounds you. The Beach Club’s neighbor, the Yacht Club, is not left out of the holiday cheer. 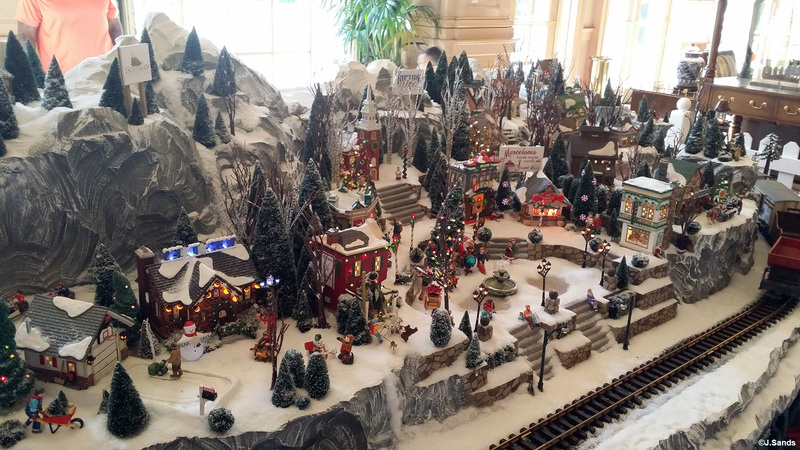 Model train enthusiasts will especially love this resort’s decorations. 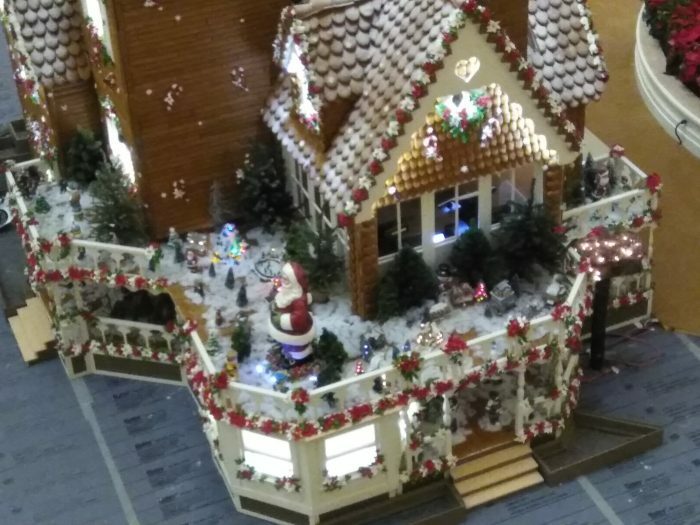 A large model train display is set up in an area of the lobby. Be sure to read the signs of the local businesses in this train village – they may sound familiar (they are names of restaurants in the resort). 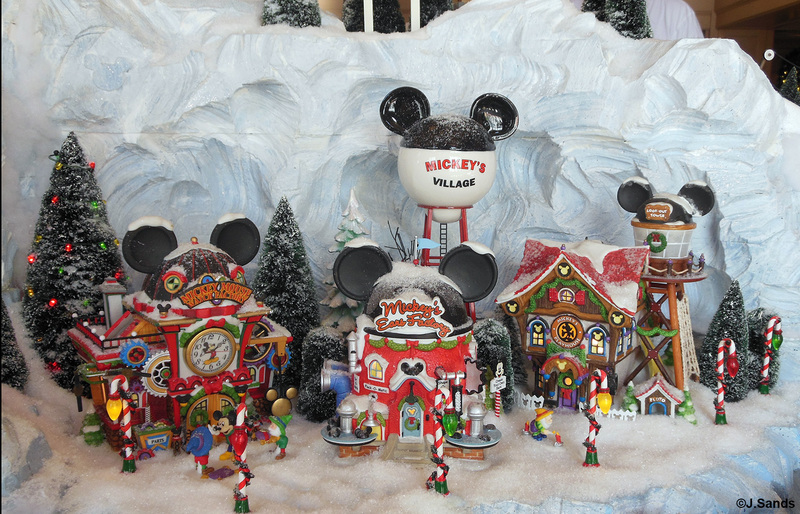 This display is 360 degrees, and on the “back” side of the display you’ll find a Disney village with a water tower that has Mickey ears! On the other side of Crescent Lake is the Boardwalk Resort and entertainment district. 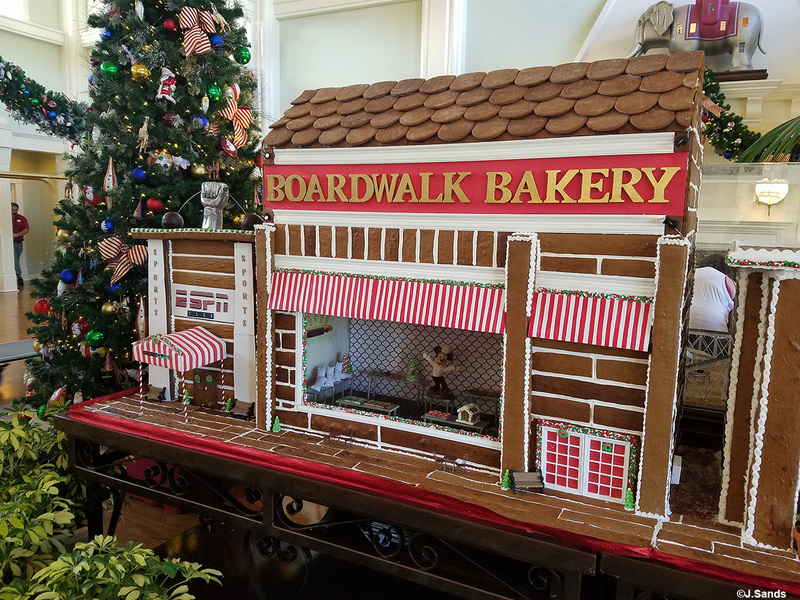 In the lobby of the Boardwalk Resort you’ll find a model of the entire area made out of gingerbread. 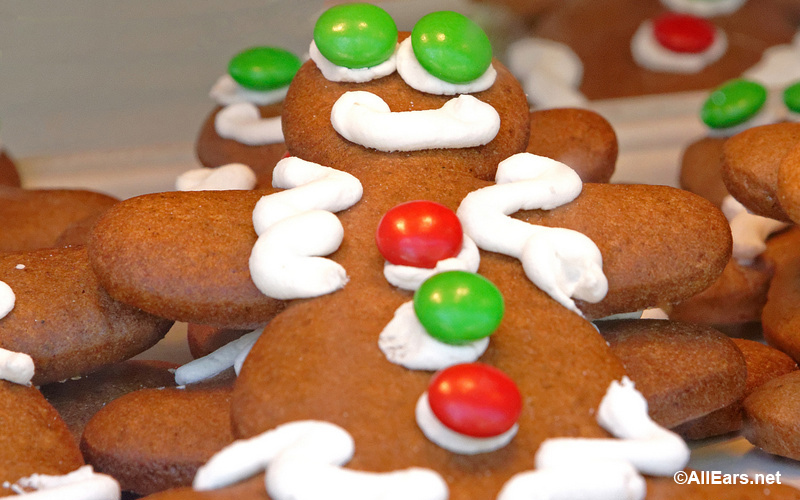 You’ll also find a shop here selling gingerbread and peppermint sweet treats. Boardwalk Gingerbread Display — Can you see the chef? It’s Mickey! Just beyond the BoardWalk are the Walt Disney World Swan and Dolphin. Taking a walk over there, where they call themselves “Santa’s Favorite Resort,” is also worth the trip. The palm tree-lined causeway between the two hotels is home to a Santa Claus meet-and-greet, and holiday music fills the air. The kids will get a kick out of seeing Santa in his tropical attire and Mrs. Claus in her muumuu! Heading inside, the Dolphin’s recently renovated lobby is a site to behold on any given day, with its beautiful lobby bar, Phins, and the amazing almost-floor-to-ceiling crystal chandelier. The holiday decor adds a festive-yet-classy touch. Over at the Swan, though, is an eye-popping holiday display, made entirely of chocolate! 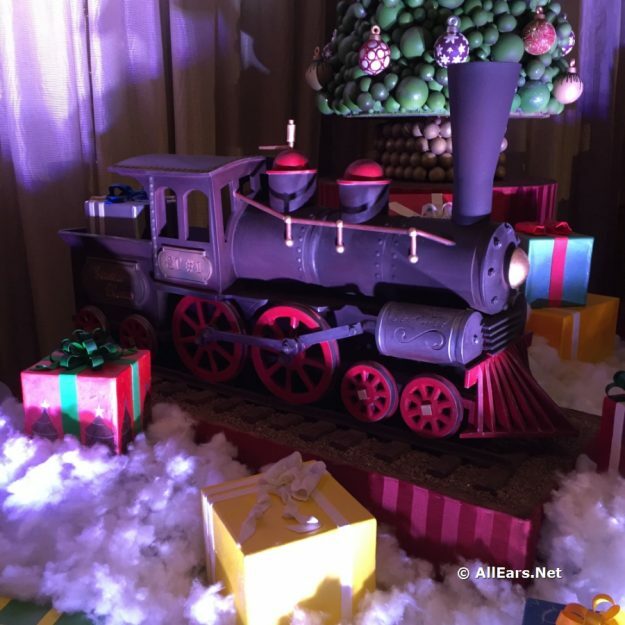 There’s Santa, taking a break from his Christmas travels, sitting beside a chocolate tree, with a chocolate toy soldier by his side and an old-fashioned locomotive — also made of chocolate. It’s a sight to behold during the day, but at night it is magical! 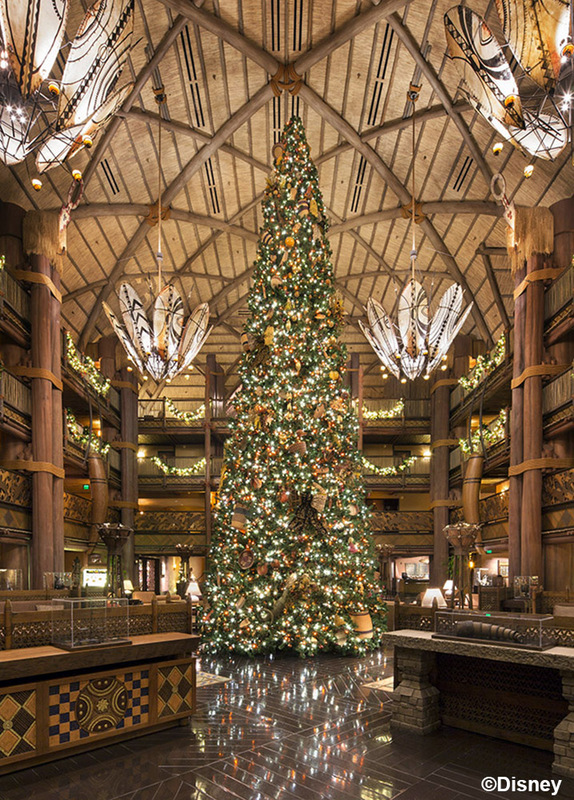 The Animal Kingdom Lodge, like Wilderness Lodge, is impressive any time of the year. Stopping here at Christmas will allow you to see a 45-foot-tall Christmas tree standing IN the lobby. We told you it is an impressive lobby! Our last thing on this list is the food. 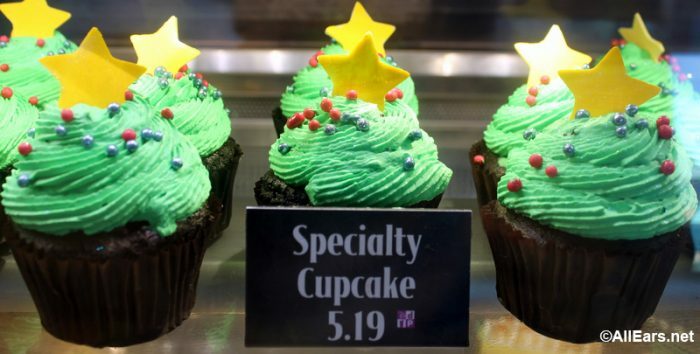 We’ve already touched on some locations, but whether you’re in Disney Springs or any of the resorts you are certain to find holiday specialty treats including cupcakes, cookies, ice cream, and more at the quick-service and counter locations. Table-service restaurants in these locations may also be serving up some holiday specialty dishes during the season as well. Stop at the check-in desk and ask about any specials when you are in the area. There you have it! 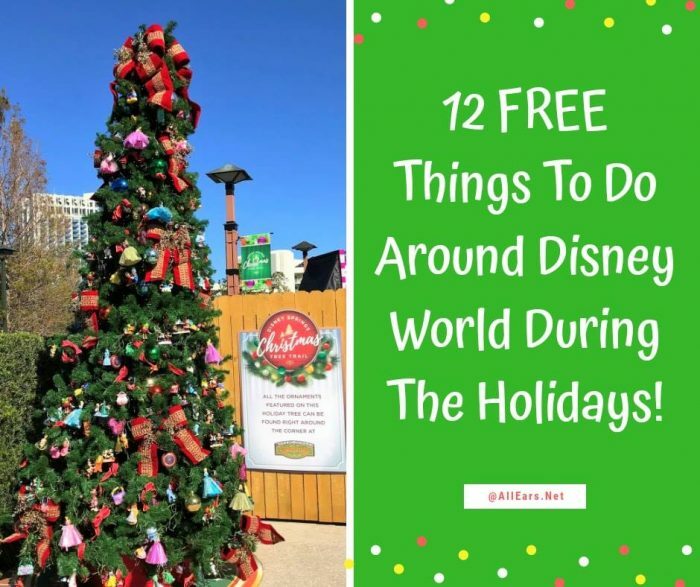 More than 12 free and low-cost things to do in and around the Disney resorts! How many of these have you done before? Are you planning to do any of these this Christmas? For more ideas of what to see and do, be sure to check out our Ultimate Guide to Having a Happy Holiday at Disney World! 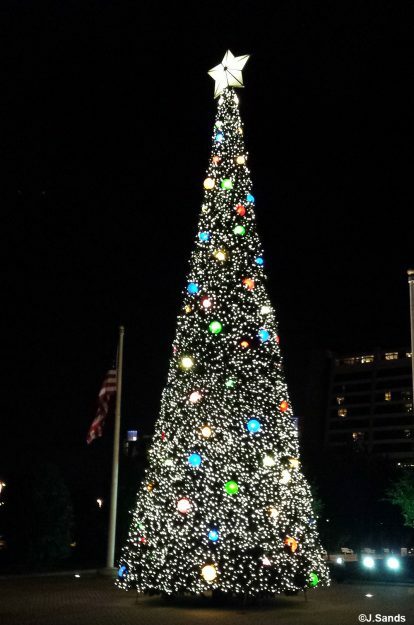 When we lived in SE Georgia we drove the 3 hours to Disney several times during the Christmas holidays and just hung out at Disney Springs (It will always be the Disney Shopping Village to me) and the Disney hotels. The gas and the cheap motel we stayed in weren’t free, but it was a cheap way to get in the holiday spirit, Disney style. My kids always loved that they could ride the monorail without actually going to the parks. One thing missing from the list. Ft wilderness campgrounds! My family loves going to chip and Dale’s campfire sing along which becomes ultra festive for the holidays as well as seeing all the campground decorations. Although not free, the wagon rides are not to miss and are a holiday tradition! Tom, you’re so right! Definitely a worthwhile addition! Thanks!